SLEEP GREAT AGAIN: You can't get the rest you need if your topper and mattress move and make your bed uncomfortable or unstable. Our slip-resistant pads are the perfect solution to help stop mattresses from sliding. They are designed to hold even the heaviest mattresses in place so you can wake up in the morning refreshed and ready for a brand new day! VERSATILITY: Our Gorilla Grip Mattress Gripper Pads come in all mattress sizes. Plus, they can be used for your futon, daybed, sofa, or chairs with cushions that move or slip. It's also a great solution for drawer liners, and to keep mats or rugs from sliding. CUSTOMIZABLE FOR A PERFECT FIT: Our Mattress Gripper Pads come in a variety of sizes to fit standard bed and mattresses: Twin, Twin XL (perfect for dorm rooms), Full, Queen, King, California King, and Futon. If you need to customize your size further, simply trim your pad with scissors to fit uncommon sizes. Please note, your pad is intended to be slightly smaller than your mattress so your grip pad is not visible. SIMPLE AND EASY: Your new slip-resistant mattress pad is a snap to use! 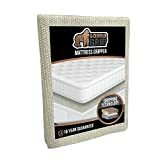 Lift your mattress, place the pad on to your bed's platform or box-spring, and put your mattress back where it belongs. Making your bed will be much easier each morning because our pads help keep your bed locked in place. GUARANTEE: GORILLA GRIP means you are getting tough durability, and long-lasting effectiveness. We are proud to offer our customers a 10-Year No Questions Asked Warranty. If for any reason you are not happy with your product, please contact us (through Amazon if past the standard return window) and we will be happy to assist you. We want our customers to love our products as much as we do!